The model 5186 is a high input impedance, low-noise, AC-coupled, voltage preamplifier which offers a true differential input. It has a frequency response from 0.5 Hz to 1 MHz and three switched gain settings of ×10, ×100 and ×1000. 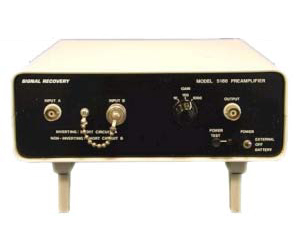 It is a general purpose preamplifier which has the facility to be connected to grounded sources in a manner which breaks ground loops and since it has a truly differential input it can be used to measure floating sources, such as the output from an AC bridge, without imposing an asymmetrical load onto the source. It can be powered from its own internally housed (alkaline) batteries, an external low voltage supply (±15 V or ±18 V) or from the model PS0108 remote line power supply (optional extra). This preamplifier can also be powered from most of our range of lock-in amplifiers and from the model 7310 noise rejecting voltmeter.